Room signage and office signage with electronic signs is a simple way to manage meeting spaces and display up-to-date schedules in real-time. 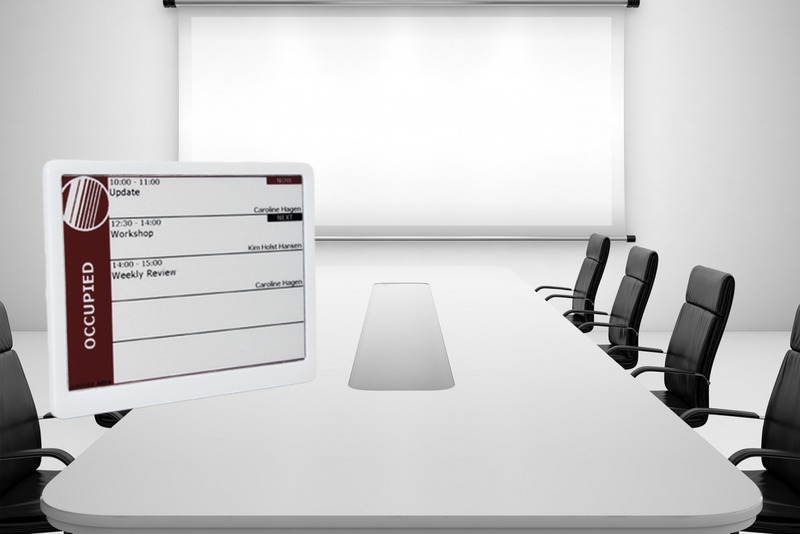 Connected to your calendar, meeting reservation system or other data sources, the electronic meeting and conference room signs are automatically updated via a wireless network. Room signage is perfect for offices, meeting rooms, schools and universities, hospitals, appartments, personal door signs, etc. Get control of your meeting and conference spaces with electronic room signage. The wireless room signage solution communicates via a 2-way radio frequency with no interference from other wireless systems. With no cabling or wiring requirements, the wireless door signs are perfect for mounting on glass and other areas with a streamlined design. Any information can be displayed on the electronic signs to help staff and visitors locate meeting rooms, conference rooms or simply just any space where room signage is needed. The room signs are easily mounted on walls, doors, etc. outside meeting rooms, conference rooms, storage rooms and other rooms. The electronic signs have changeable batteries and long life (typically 5 years with up to 5 updates per day). The room signage solution offers standard interface options to your calendar, which makes it possible to update the room signs by simply just creating an event in your calendar. Be visible with our dynamic room signage and office signage solutions. We help you to organize and identify meeting rooms and spaces with accurate and real-time information, enabling your surroundings to easily navigate. We provide you the room signage solution you need to add a professional touch to your meeting rooms, conference rooms or simply just any spot where accurate room signage is necessary. 1, 2, 3 and you are ready to go with our plug and play Cloud solution. Breece Cloud is only a click away, offering simple management and the flexibility of accessing your data and applications from any device.